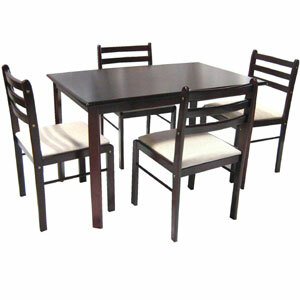 Furnish your dining room with this comfortable and cozy set of table and 4 chairs. It comes in 4 beautiful colors (Beech, Dirty Oak, Mahogany, Cappuccino), that will match any dªcor.. Easy to assemble. Strong Construction. Table Size: H 29 L 43 W 27.5 in. Chair Size: H 33 W 17 D 16 in.